You can say that many people call the Hobie Mirage Eclipse Stand Up Pedal Board Unique. It is unlike anything that people have seen before as it combines the looks of a scooter with a paddle board. The result is a board that reworks anything that anyone has done before and made it into a completely different workout that uses the strongest muscles in your body, you legs. Don’t get me wrong, I love paddle boarding as much as the next person but you have to admit there are limitations to it, especially for beginners starting out. You have to first learn how to get up on the board, balance and figure out it’s limits. It also takes a while to get anywhere, often times if you want to explore an area for an extended period of time it is just better to kayak. The Hobie Mirage Eclipse Stand Up Pedal Board is sturdier, and quicker than most paddle boards and the learning time is much quicker. As an example I will relate it to Getting on a scooter as a opposed to a skateboard. It is way easier to learn how to scooter right? That’s because it has handles that you can hold onto for balance, similar to the Mirage Eclipse. Check out this video that will show how quickly the learning curve is as opposed to me trying to explain it. Who is the Mirage Eclipse Stand Up Pedal Board for? Who is the Mirage Eclipse Stan Up Pedal Board not for? What is the Hobie Mirage Eclipse used for? The Hobie Mirage Eclipse Stand Up Pedal Board is used for pure recreational purposes and can be used one one of two ways. One as a pedal board that allows you to efficiently glide through the water with the Hobie Mirage Drive and handlebars attached. Two as a actual paddle board when the mirage drive and handle bars are removed. It ultimately depends on where and who you are paddling with. For traveling greater distances or with a fellow kayaker or Eclipser I would use the pedal drive system as you can go at a quicker or more controlled pace with the pedal drive system which adjusts to how fast you pedal. It would be harder to do that if you use this as a paddle board because you can only really paddle so fast. 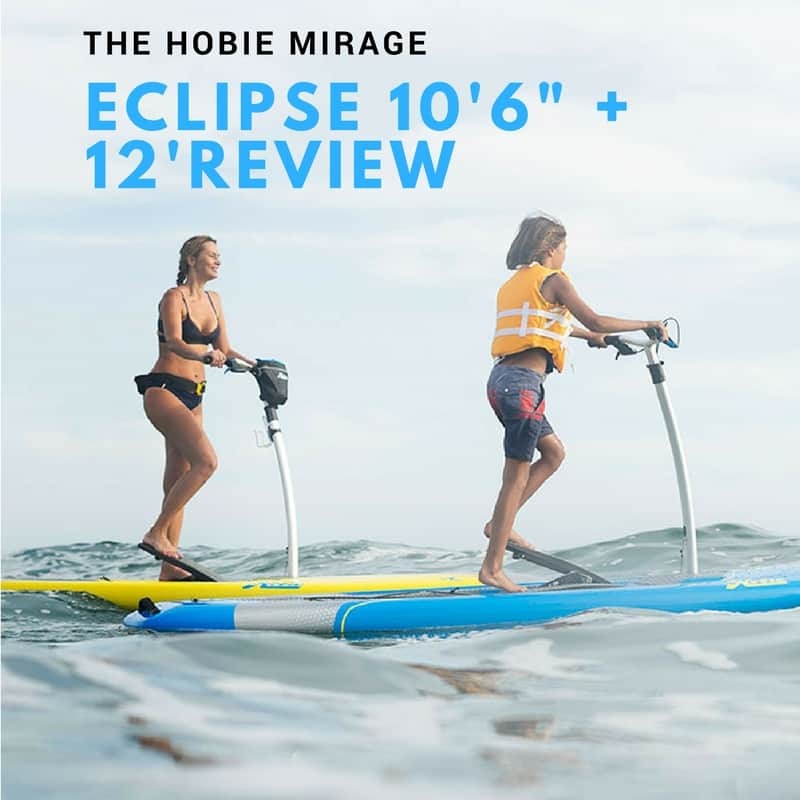 So if you are with fellow paddle boarders and you like them enough to not want to leave them behind I would use the Hobie Mirage Eclipse as a paddle board. The Hobie Mirage Eclipse Stand Up Pedal Board 12 ft is a bit on the heavier side when it comes to paddle boards with a 48 lb fitted weight (Nor Handle Bars and Mirage Drive) and a 58.9 lb Rigged weight . The 10’ 6’’foot model fitted hull weight is 43.2 lbs and fully rigged weight is 54 lbs. So one of the questions you may be asking is what is the main difference between the Hobie Mirage Eclipse 10’ 6” and the 12’ model? The main difference is the weight capacity and the tracking ability. The maximum weight capacity for the 10’6” is 225 lbs(102 kg) and the max for the 12’ is 275 lbs (125 kgs). As you may or may not know generally a rule of thumb is that the longer and more slender a watercraft is the better it tracks through the water. The 12’ would have better straight line ability while being able to take on more weight but it would take up that extra foot and a half of room and is slightly more difficult to maneuver than the 10’6”. Below is a youtube video that really shows you the speed of this craft when fully fitted and the amount of fun that can be had by all! The Advanced Composite Epoxy allows this Pedal Board to be just about as durable as possible. It really has to be as the speed that this board can go when fully rigged is much quicker than your traditional paddle board. So the materials needed to be as strong as possible and allow the board to bounce off an object on impact. The Hull Design is inspired by Touring Paddle Boards featuring a pointed nose and a square tail. This sleek Hull design allows the Hobie Mirage Eclipse to cut through the water. Rounder Hull designs would not simply work as water would be directed on to the board getting your feet wet and creating more drag than need be. With Speed you need stability and this board more than provides it thanks to it’s 33.5” Width and it’s adjustable handle bars. This lets the Hobie Mirage Eclipse have a less “Tippy” feeling than some Touring Paddle Boards. The component that makes this board special is it’s patented Miragedrive Technology that is also found in Hobie’s famous Mirage kayaks.Believe it or not the Mirage Drive is actually inspired by they way penguins propel themselves in the water! The Mirage Drive allows you to use some of your strongest muscles (The Legs) to propel you forward at a speed that is greater than most Paddleboards or Kayaks can provide. Having said that the Eclipse goes as fast as you want to pedal. How the Mirage Drive works is that every time you step on the pedals the fins paddle in a smooth criss cross motion that propels the board forward. It almost looks like that you are on an elliptical machine on the water. The comparisons are not too far off either as it works similar muscles and goes as far as you want it to! This is a great way to get a similar leg workout without having to go to the gym and explore your surroundings instead! These handlebars give you the ultimate stability that you don’t find on paddle boards.Grappling onto something gives you better balance and a sense of security. Case in point a treadmill, when walking on a treadmill you feel way more balanced when you are holding onto the bar in front. When you are not holding onto the bar you feel less stabilized and have to think more about your balance. The same principle can brought to Paddle Boarding versus using the Hobie Mirage Eclipse. The Handle Bars are also where the steering is located. The Handle Bar resembles that of a bicycle but it’s use is much different. Instead of squeezing the finger pedals to brake you squeeze them to steer the board. Squeeze right and you will maneuover your board right, squeeze left and the board will maneouver left! The Mirage Eclipse actually has a very good turning radius and can almost turn on a dime! The Handlebar is adjustable as well and can adjust from 36 to 43 inches to provide the perfect fit with the Pedaler. It is also very simple to remove and install onto the board with quick flips of some cam locks. When using the Squeeze Steering System you are controlling a rudder that is located towards the back of the Hobie Mirage Eclipse. It offers pin point steering that is better than just about any paddle board and can be used as a locked in tracking skeg on the long straights. The Rudder can kick up when you get to shallower waters and is easily removable. The Eva Deck Pads are features on the pedals as well as on the board to get the maximum grip in the slipperiest of conditions. It also has comfortable cushioning for those of you who like to go on full day excursions! The Deck Pad works just as great if you use the Hobie Mirage Eclipse as a recreational paddle board! As fast as you could hope to go on a paddle board! Fantastic Steering control, it turns on a dime! The Hobie Mirage Eclipse can handle its own in many different water environments but many seem to prefer to use it in the Ocean. Having said that it is perfectly acceptable to use this in lakes and bigger rivers. The Hobie Mirage Eclipse does best in calmer waters. It can handle its own in some chop but I would not take it out in surf as that is not it’s designed purpose. You are hardpressed to find a customer out there who does not think it is fun. Many Customers really like this concept because it is very stable and you do not have much of a trial and error period. Paddle Boards usually take a bit of time to get used to before you can master but with this watercraft you simply hop on and motor off into the distance! I have come across a few people who have tried it and have said that it is one of the most stable things they have rode on! A big part of this has to do with the stability that the handle bars provide. While the Hobie Mirage Eclipse is generally favourable among participants some of the most common complaints were about the price. Some people felt that while the Eclipse is great fun they questioned how many times they would use it. These people do have a point but I believe life is what you make of it so if you enjoy using it, make an effort to get out there! The first of it’s kind Hobie has outdone itself again! The Hobie Mirage Eclipse is a great way to incorporate legs day when you are out in the water. Some of the biggest things that it has going for it are its blistering speed .In fact I came across a site where someone was saying they were doing a 64 mile marathon on the Eclipse and it ended up finishing 2 hours ahead of the next paddle board! Of Course the Hobie Mirage Eclipse does this by Pedal Power which is courtesy of the Hobie Mirage Drive. Found in Other Hobie products such as their fishing and recreational kayaks, the Mirage drive acts as an elliptical on water. The harder you pedal the harder your legs work and the sooner you will be out of breath! The stability and the ease of use are the next biggest things going for the Hobie Mirage Eclipse. When you first get on and get some momentum from Pedaling the handle bars makes you feel extra secure which is something that takes an extra amount of time with Paddle Boards. You are never really in any sort of danger of falling off unless you really try to tilt it one way or the other. The Squeeze Steering System is also very well designed. SImply squeeze right to go right and squeeze left to go left! I would advise on just tapping it the first time you are on, if you are going at a good pace and suddenly take a hard squeeze right it almost acts as a brake and there’s a chance you may end up in the drink! The Rudder system is also a big plus on this board! Besides the Squeeze steering system it can also lock into place and act as a skeg for long journeys as well as be retracted up to prevent any sort of damage. Some of the things that are not so Raven (get the reference? No? ok) about this board is the price tag associated with it. It is almost the same price as a Hobie Mirage Kayak which kind of makes you scratch your head a bit. Still some say that you cannot put a price tag on good fun and the Hobie Mirage Eclipse certainly provides its fair share of it! A Hobie would not be a Hobie if there were not any additional accessories that you can purchase! Helps Protect your board when your are traveling to avoid scratches and scuffs. Are you a fishing Enthusiast or have a lot of gear to carry around? The H Crate is perfect for that! Simply mount it onto your Pedal Board and you are good to go! It features four rod holders, a 7X4 pre-drilled Gridwall for mounting additional accessories that you may need like additional rod or cup holders. This accessory is great if you are planning on going for a long day trip! Don’t forget to bring some snacks! The Hobie Mirage Eclipse is pretty heavy in relative terms of a paddle board. If you don’t feel like lugging the board and accessories by yourself there is the Fold and Stow Plug-in Cart. There are a variety of different carts to choose from so it is best to choose one that fits the terrain you will be towing the Pedal Board on.